If you have items to donate they may be dropped off the Monday, Tuesday and Wednesday prior to the sale. All proceeds from this event will go towards the ongoing preservation of this 1844 homestead. Canned goods would also be appreciated for REAP for allowing us to use the facility. See you there! Saturdays and Sundays from 1-4 p.m.
You will be surprised by all of the changes taking place. 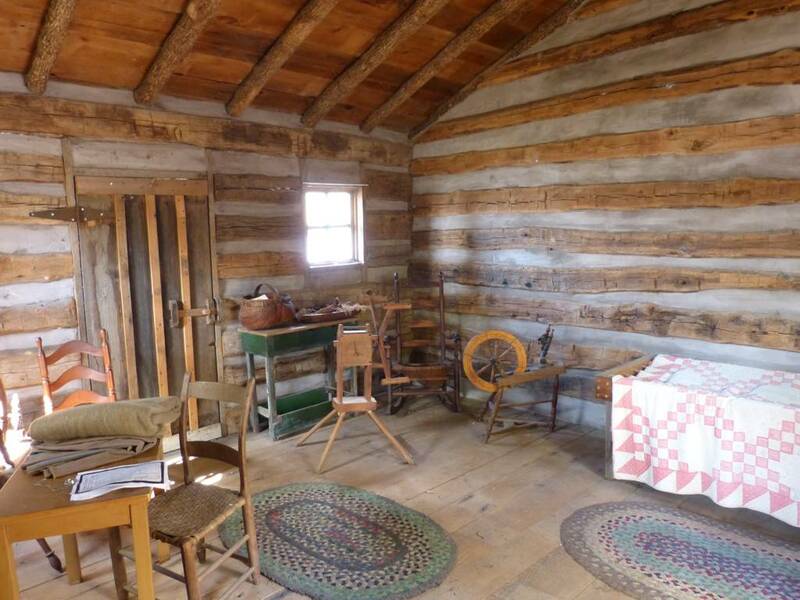 Tour the Rice-Tremonti Home and Cabin built in 1844 on the Santa Fe Trail. 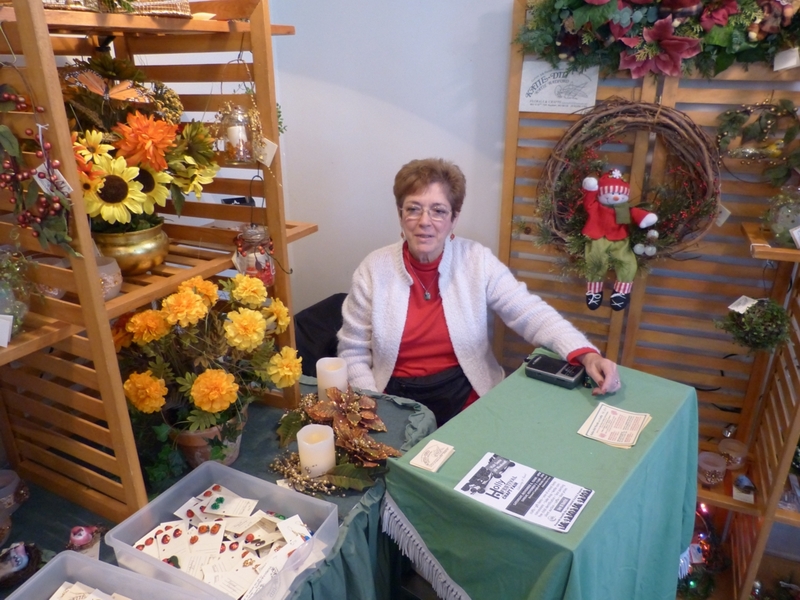 Enjoy refreshments~ shop the Christmas Store & Bake Shop. Step back in time to an era before TV and the Internet! 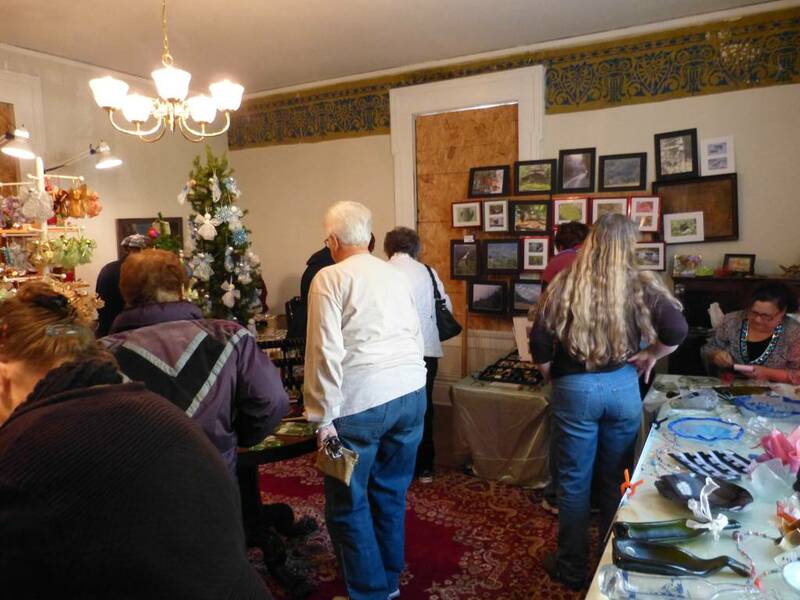 Stand in a house that has been through the Civil War and 167 years of history right here in Raytown~ Missouri. Put this special treat on your calendar. Groups Welcome. Plan to join us for a wonderful meal of Soup, cornbread, homemade pie and a beverage for only $7.00. 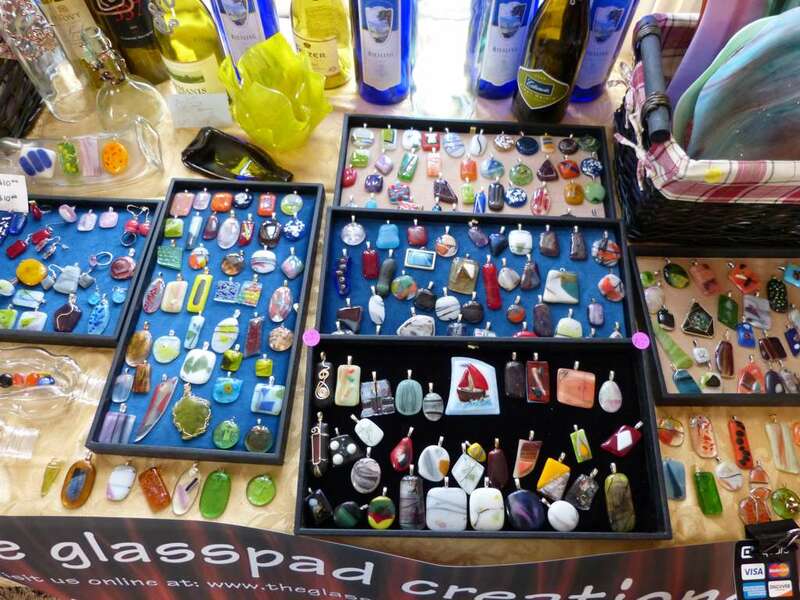 After eating you can also browse the great selection of craft booths, for a little early holiday shopping. 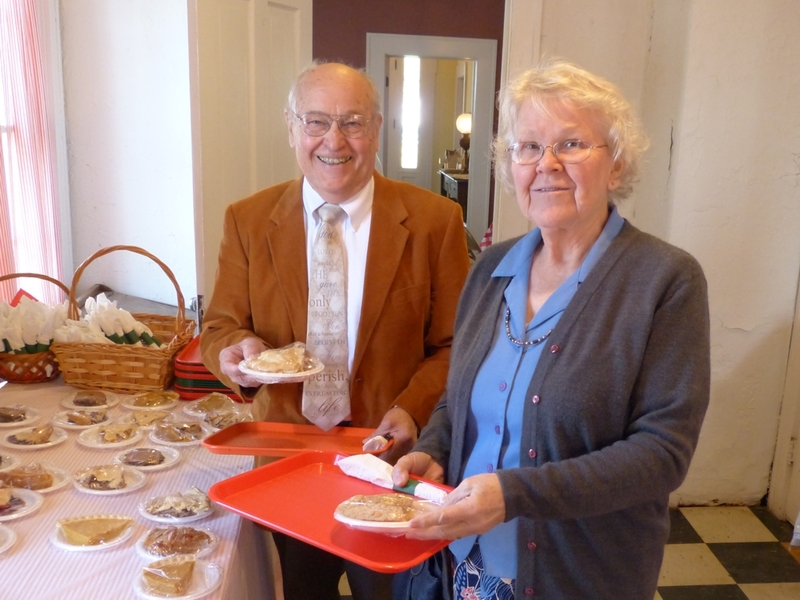 All proceeds will be used by the Friends of Rice-Tremonti for the ongoing preservation of the 1844 home. 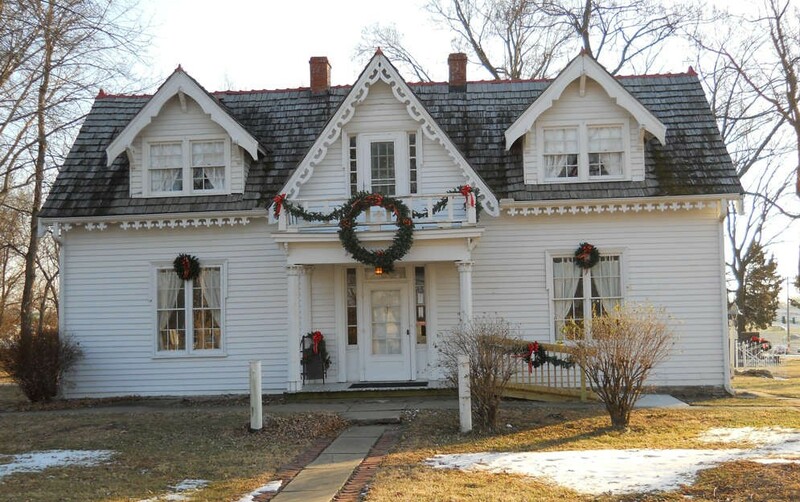 Friends of the Rice-Tremonti Home are looking for individuals or groups who would be interested in helping repaint this Historic old home In Raytown. We will provide the paint if you help us with the labor. 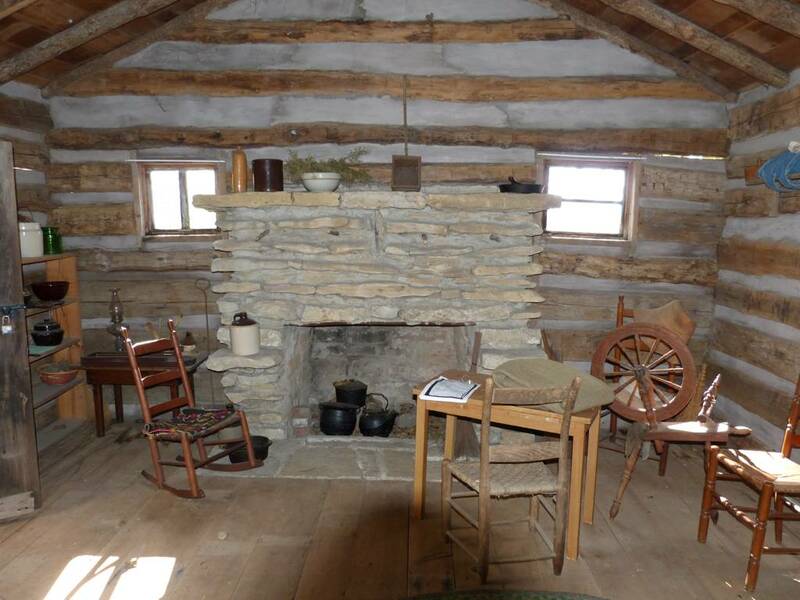 The Rice-Tremonti Home and Aunt Sophie’s Cabin will now be open to the Public, Saturdays and Sundays from 1-4 pm, beginning May 31, 2014. Turn back the hands of time to the 1920’s when the Rice-Tremonti Home was as Chicken Dinner Restaurant, ran by Edna Paschal. Many changes to the interior took place during this time period to accommodate large serving areas. 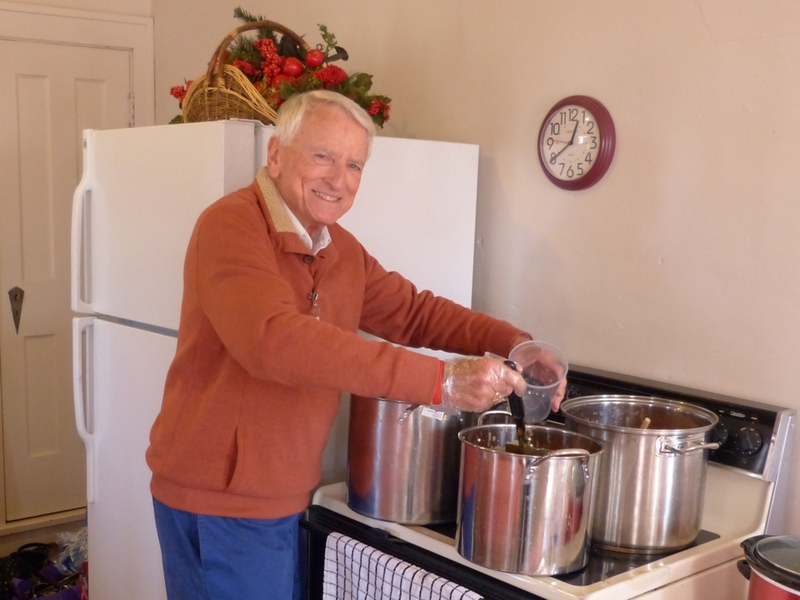 Join The Friends of Rice-Tremonti, to honor the history of this home with an old-fashioned chicken dinner, with mashed potatoes, green beans and fruit cobbler. Tickets are $25.00 per person, reservations are required. All of the profits from this event go towards to upkeep and maintenance of this Historic home, please mark your calendar and join us April 26th. The new Board of Director of Friends of Rice-Tremonti were elected into office Jan. 15,2014. They are as follows:. The Board will be holding a planning session instead of the normal February meeting in order to determine future projects for the Home. 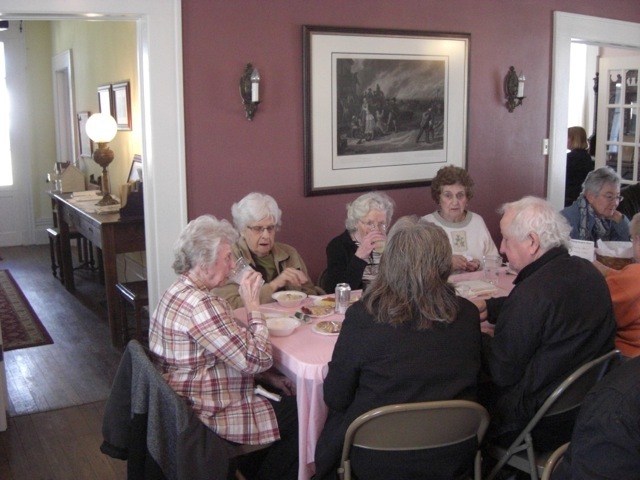 The event was held last year at the Pre-Civil was home in Raytown, and was attended by many local residents. Scattered to the Four Winds: General Order No. 11 and Martial Law in Jackson County, Missouri, 1863. Come visit us at this historical landmark and see all of the wonderful , Christmas decorations. Each room has been decorated by area volunteers. 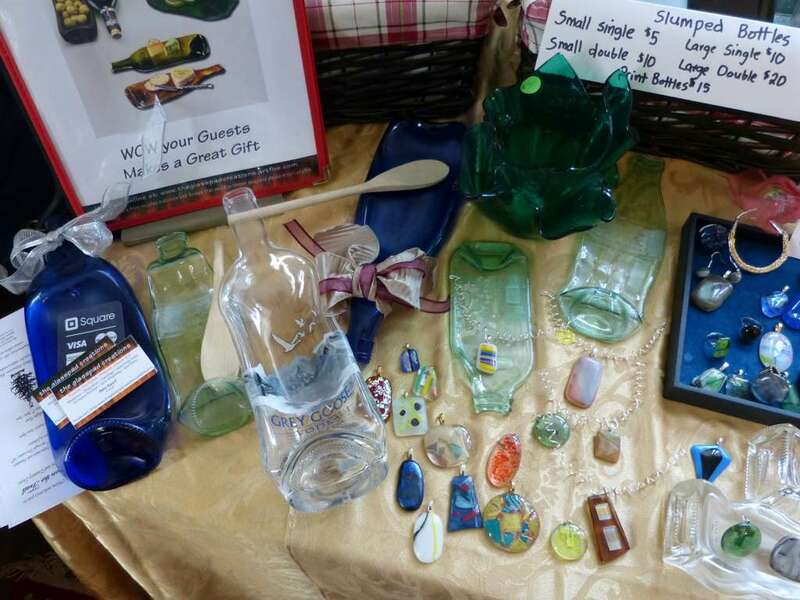 And as always we have the General Store open so you may purchase goodies to take home. The fundraiser continues from 11am to 4pm Today. The soup and deserts are great and the cause is good. Here are some photos and a short video taken yesterday. The Rice-Tremonti Home will observe the 150th anniversary of the issuance of General Order No. 11 by hosting an all day series of dramatic re-enactments on Saturday, Sept. 14 that will explain how martial law depopulated Jackson County in 1863. In cooperation with the Jackson County Historical Society, a large group of living historians will recreate several scenarios depicting actual accounts of those who experienced the draconian events and aftermath of General Order No. 11. The order resulted in the complete depopulation of all citizens regardless of their political support for the south or the north from the western border counties of Missouri located within the District of the Border (the Counties affected were Jackson, Cass, Bates & Vernon County, north of the Osage River). Cost for the candlelight tour is $10 per person. Many of Jackson County’s homes and farms were destroyed during this time period in the Civil War. Many say the area had a burnt appearance for years after the war and took on the moniker of The Burnt District.” The Rice family had evacuated to Texas in 1861, prior to issuance of the order. For reasons unknown their 1844 farmhouse survived that dangerous episode of local history. The Rice family returned and reclaimed their property in 1866. The Rice-Tremonti Home is located at 8801 E. 66th St. (the corner of 66th Street and Blue Ridge Boulevard). For more information and to order tickets for the candlelight tours go to the website: www.ordernumber11.org. For more Rice-Tremonti history go to www.rice-tremonti.org. The Rice-Tremonti Home will be open for tours Saturdays and Sundays from 11-4 from now through October 13th. This Antebellum House was built in 1844, survived the Civil War and still proudly stands right here in Raytown. There is a $3.00 per person donation with children being free. Guided tours will be given with stories of the Rice Family and Aunt Sophie from 1844-until the late 1800’s. 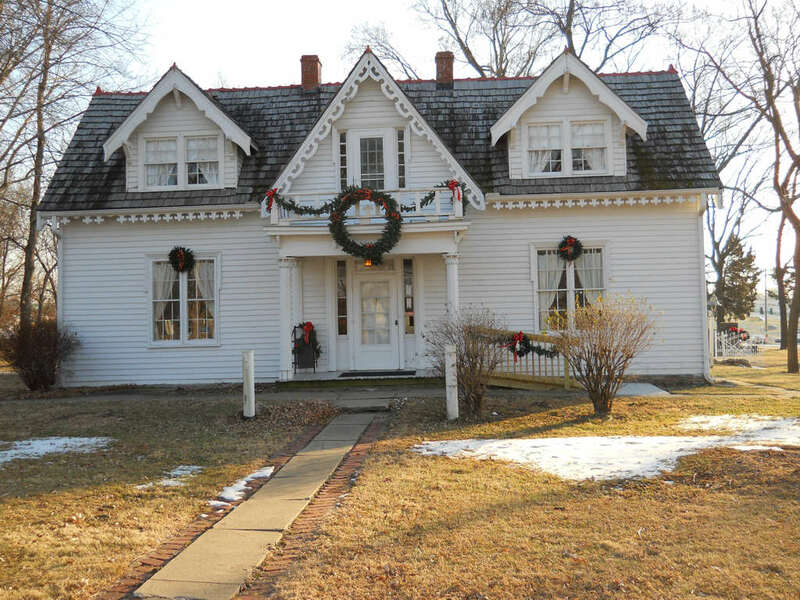 This home also served as a chicken dinner restaurant and finally was owned by Dr. and Gloria Tremonti who remodeled it in 1935 and mate it their country home. The Friends of Rice Tremonti currently own the property and are charged with the up keeping of the home and property. Won’t you stop by and let us show this wonderful home to you? 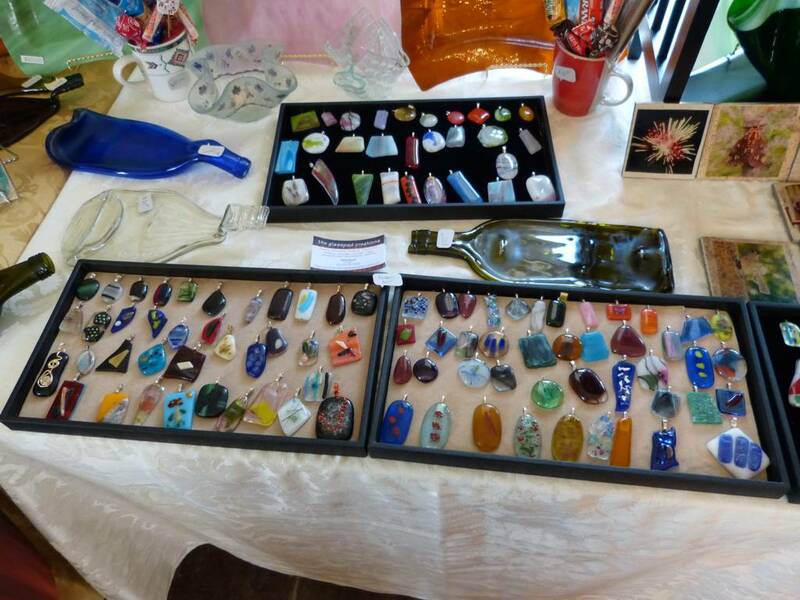 The bi-annual Rice-Tremonti Home Garage Sale will be conducted June 6-8, 8 a.m. – 5 p.m. each day. The big twist this year, however, is that the sale won’t be held in the house or on the grounds. 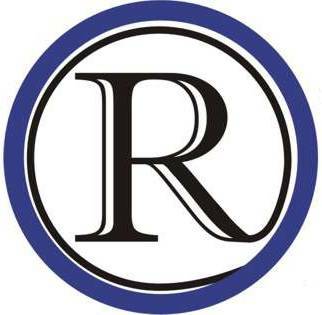 The Raytown Emergency Assistance Program (REAP) management has graciously allowed Rice-Tremonti to utilize their great facilities to hold the sale at the REAP building, which is located at 9300 E. 75th St. in Raytown. Because REAP is the primary food bank for residents of the Raytown area, we encourage all contributors and attendees to bring canned goods with them to the sale to help restock the food bank shelves. Rice-Tremonti is looking for donations of your “good junk” including furniture, knick-knacks, decorative items, children’s clothing, toys, usable tools, books and functional household items. Please, no tires or obsolete computer equipment. So it is important to remember then not to drop off your donations for the sale at the house. Drop off your items at the REAP building beginning on Monday, June 3. 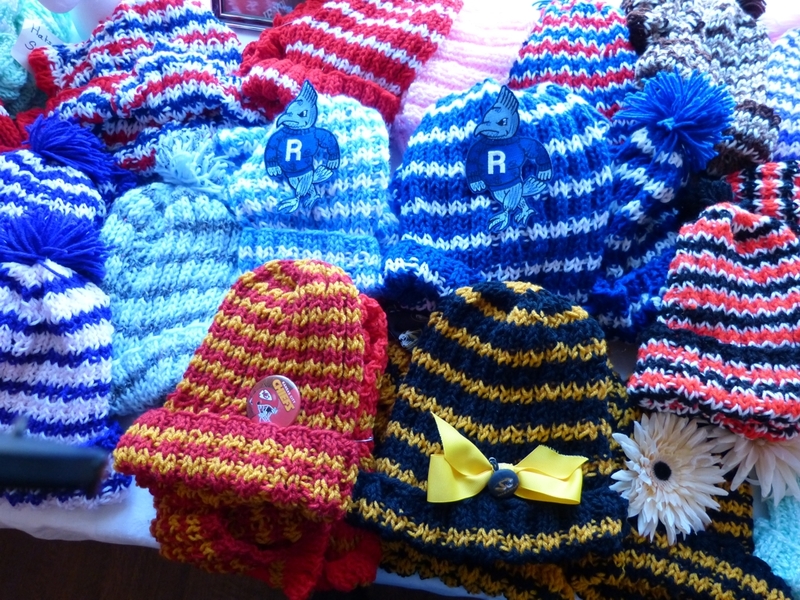 Rice-Tremonti will have volunteers working at the REAP building in the week before the sale to accept your contributions and to store them safely out of the weather. 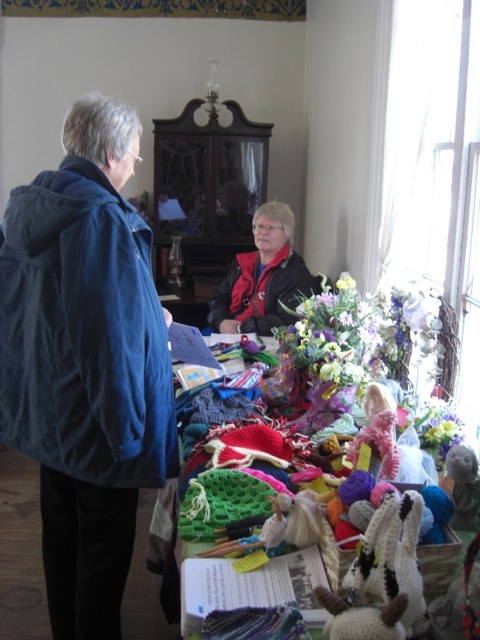 Because of the wear and tear that the garage sale puts on the historic home, the Rice-Tremonti board decided that the sale could no longer be held inside the house. And we can’t hold it outside because it might rain. So REAP has come to the rescue with the use of their large facility. If you are unable to drop off your donations at REAP, please call Leigh Elmore, 816-333-3586 or Phyllis Miller, 816-353-2338 and they will make arrangements to acquire your donations. 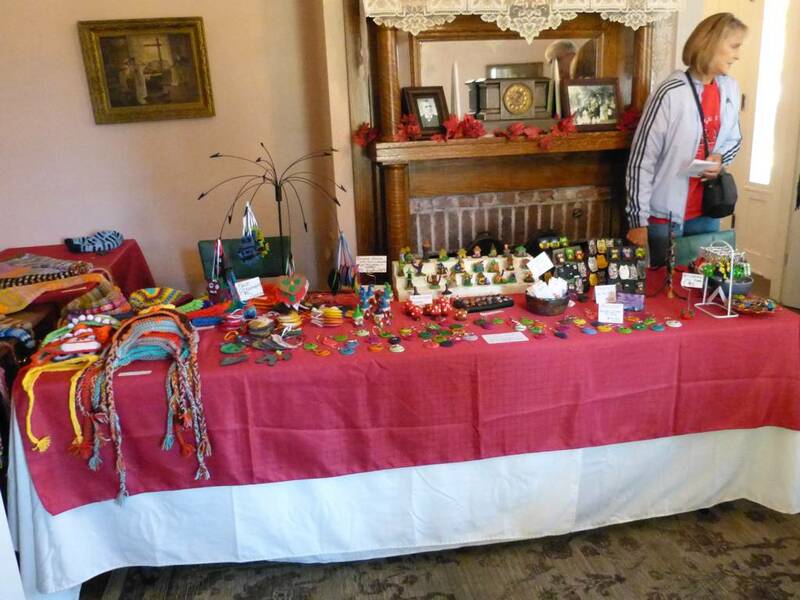 Proceeds of the sale will go toward necessary repairs to the Rice-Tremonti Home, which dates from 1844 and was a staging area for travelers heading west on the Santa Fe, Oregon and California Trails in the mid-1800s. 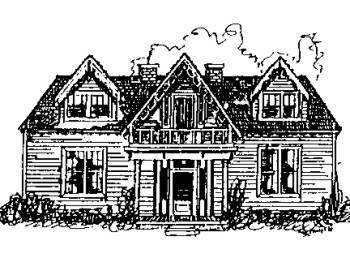 The Friends of the Rice-Tremonti Home is a 501 (c) 3 charitable organization dedicated to the preservation of the historic home. The Rice-Tremonti Home is located at 8801 E. 66th St. in Raytown. 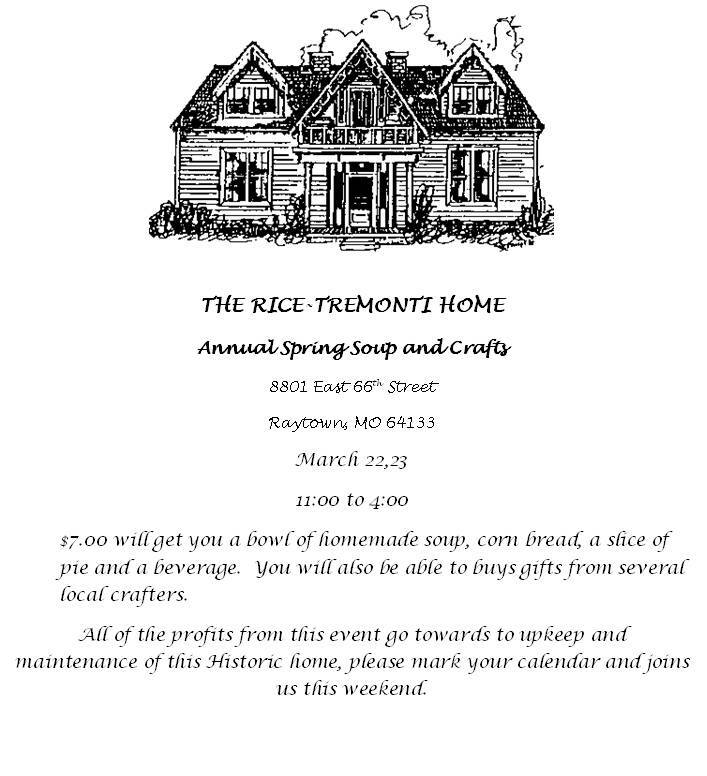 Treat yourself and your family to a wholesome lunch of homemade soup, fresh hot cornbread, homemade pie and a beverage all for the low, low price of $6 for adults, at Spring Soup and Craft Days, March 23 & 24 at the historic Rice-Tremonti Home, 8801 E. 66th St. in Raytown. 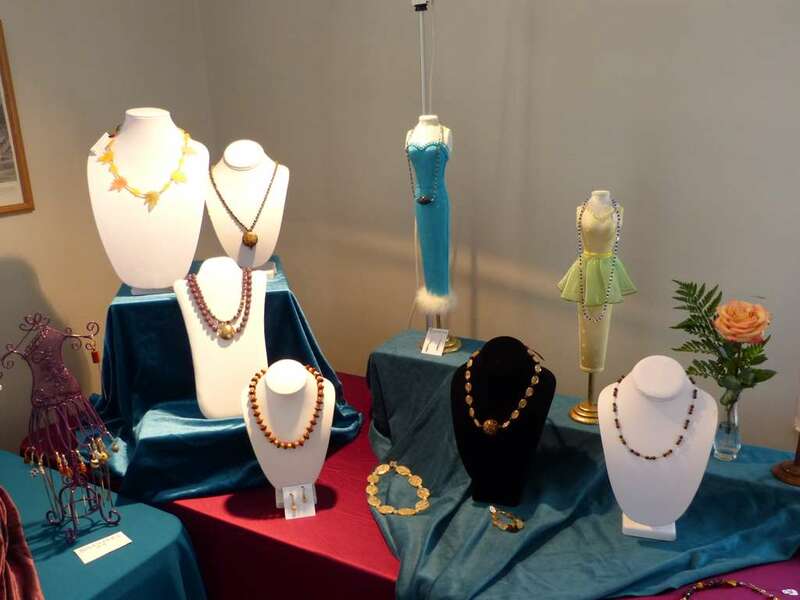 In addition, visitors to the home will be able to shop for seasonal craft items, perfect for Easter gifts, from the expert crafters who will sell their wares in the two front parlors. The activity runs from 11 a.m. to 4 p.m. each day. Bring your family and friends to this fun semi-annual get-together at the 1844 Rice-Tremonti Home, a landmark on the Santa Fe, California and Oregon Trails, and believed to be the oldest standing residence in Jackson County. The cabin where the slave Sophie White lived has been reconstructed on its original site. 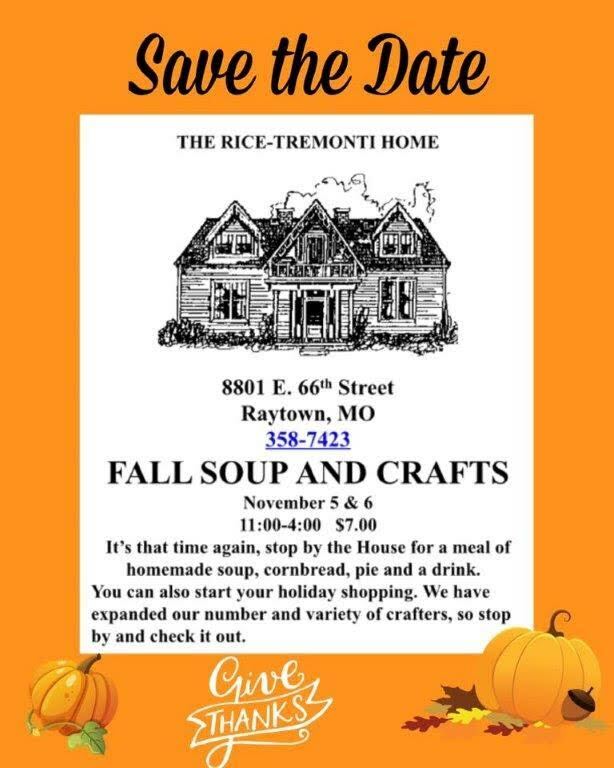 Spring Soup and Craft days is one of a regular series of fund-raisers that are sponsored by the Friends of the Rice-Tremonti Home, the not-for-profit organization that is charged with the preservation, upkeep and restoration of Raytown’s most historic structure. The home is operated as a historic house museum that interprets the westward trail era of American history, as well as its role in the Civil War. The Archibald Rice family who immigrated to Missouri from North Carolina in the 1830s built the wood-frame Gothic-Revival style farmhouse in 1844. The Rice family owned the property until 1903. Roger Lowe and his family owned and resided in the house into the 1920s. It served as a country inn restaurant for a few years prior to being purchased by Dr. Louis Tremonti and his wife, Gloria in 1935. Dr. Tremonti died in 1949 and Gloria Tremonti lived in the old house until 1987. 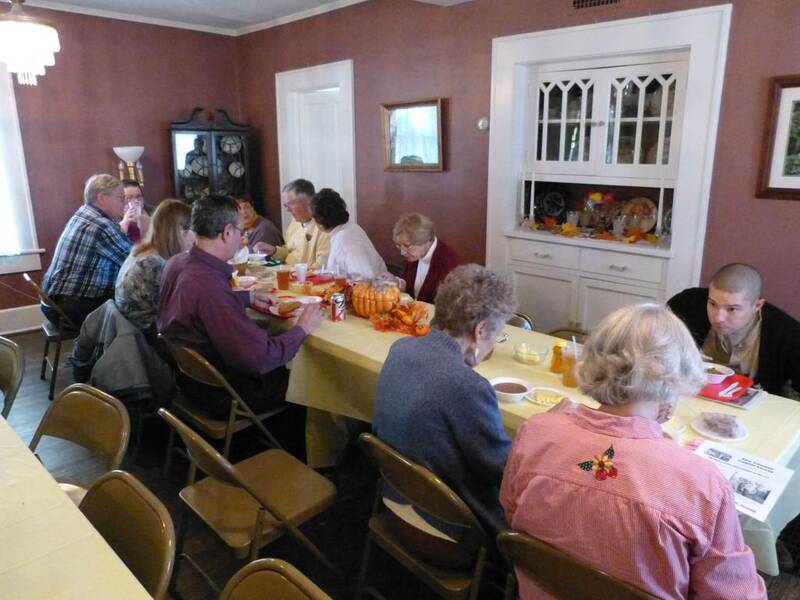 The Friends of the Rice-Tremonti Home have been preserving the property since the group purchased the property in 1988. Please support the Friends’ efforts to maintain this historic structure for future generations. 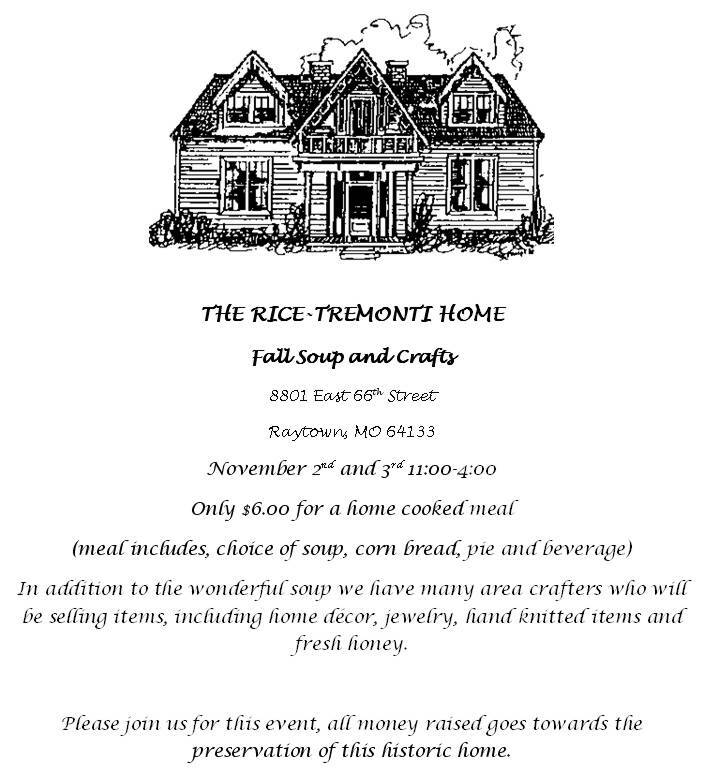 More details are available at www.rice-tremonti.org. The Rice-Tremonti Home at Soup & Craft Days has been canceled due to weather conditions and the adverse effect on providing safe parking. The event was scheduled for March 2-3. 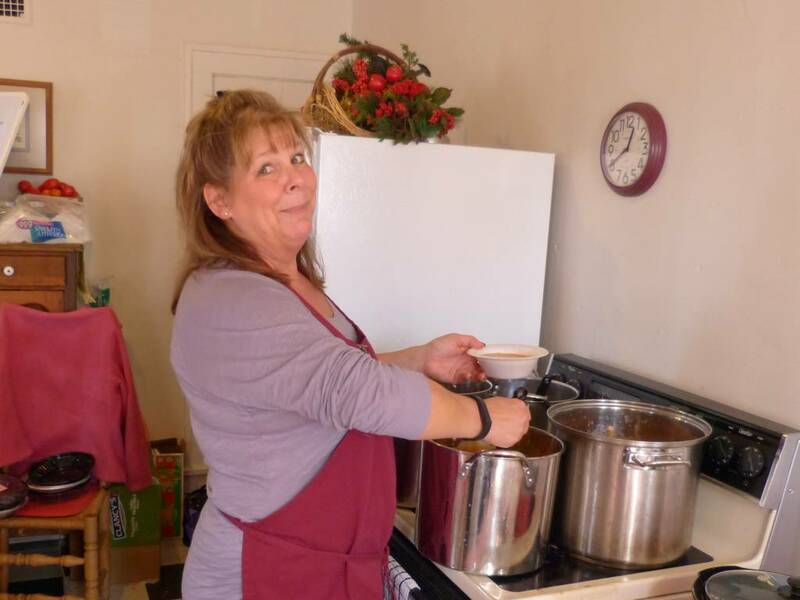 Treat yourself and your family to a wholesome lunch of homemade soup, fresh hot cornbread, homemade pie and a beverage all for the low, low price of $6 for adults, at Spring Soup and Craft Days, March 2 & 3 at the historic Rice-Tremonti Home, 8801 E. 66th St. in Raytown.